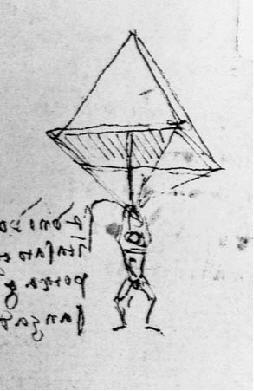 The first sketch of a "maximum drag decelerator" was made by Leonardo Da Vinci. The simple pyramidal design became the pre-cursor to the modern day parachute. Jean Pierre Blanchard claimed to have escaped a hot air balloon accident with a parachute. 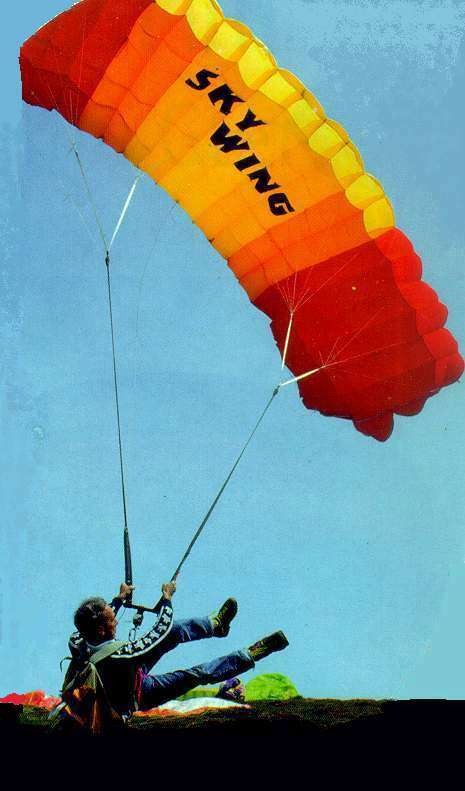 He is credited for the development of the first foldable parachute system using silk and a rigid framing system. Hans Bauer (airplane architect) and Josef Krupka (engineer) attempted the first "ski-flights" near the Kürsing shelter on Großvenediger, 2,700 meters above sea level. Using a wing-device, Josef Krupka skied down the side of a glacier, spread his arms and soared hundreds of feet over snowy tracks before landing safely at the base of the run. 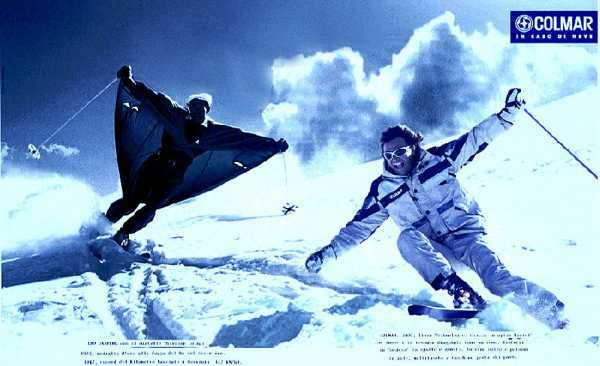 Carl I. Luther (ski instructor and ski jump constructor) sketched the first "batwing suit." He believed this would enhance "lift" and improve ascending forces during the descent. Professor Hans Thirring of Vienna and Dr. Martinak of Carinthia developed and tested a canvas coat with wide panels for downhill skiing and ski jumping. Their experience with the device inspired Professor Hans Thirring to write the book: "Der Schwebelauf" or "The Soaring Run." Leo Gasperl: "Angel of the Snow," "Fastest Man on Skis," first coach of the Italian National Ski Team, innovator and legendary champion amongst the sporting world pushed downhill skiing to new heights with his extraordinary imagination. While other sportsmen have come and gone, none displayed the elegance of Leo Gasperl. Professor Hans Thirring's mantel, used by the legendary Leo Gasperl, inspired the famous Italian sportswear designer, Colombo Mario, to produce them under the name of his company, COLMAR (a melding of his first and last name). 40 years later, COLMAR issued a commemorative advertisement featuring Leo Gasperl wearing the mantel in 1992. Andrea Kuhn and The Strasilla Brothers created the "Skywing" - a kiteskiing system using self-made paragliders and a ball socket swivel to propel the skier upwind or uphill. This eventually led to the creation of "Para-Ski" which was originally conceived as a form of mountain rescue throughout the Alps. Yuichiro Miura climbed Mt. Everest and Mt. Fuji with one mission in mind: To ski down at speeds of 165+ km/h and deploy a parachute to slow down. He is deemed a sporting legend for his efforts. H W Smith Jr., Lotus and McLaren Team racer, mechanical engineer, avid skier, and grandfather of Nick and Billy Smith (Founders of SPORTING-SAILS by Sukräfte, LLC), manufactured the first "Ski-Klipper" in Norwich, New York in late 1960s, early 1970s. As a winter resident of Colorado, H W Smith Jr. field-tested the device with Warren Miller, Karl Hötchl and good friends. After reaching a world record in Les Arc (France) in 1999, Harry Egger improved his record with a speed of 248.28km/h (approx. 154mph) three years later on "a natural ski run" in Lech am Arlberg (Austria). Partnered with Swiss Engineers and the F1 Red Bull Racing Team, he later co-developed the most aero-dynamic helmet in the world, "Emma", featuring a parachute system to properly decelerate his speed to a clean and controlled stop. Two brothers named Nick and Billy Smith made some garage-based modifications to their grandfather's (H W Smith Jr.) "Ski-Klipper" and began designing, sewing and field-testing various body-sail/parachute prototypes for downhill skateboarding, skiing and snowboarding. Inspired by their grandfather, the two brothers patented the product and established SPORTING-SAILS by Sukräfte, LLC - a melding of "Surf" and "Skate." Orville and Wilbur Wright - "First in Flight"
H W Smith Jr. (second from the left) having fun with his "Ski-Klippers"
Downhill Skateboarding, Skiing & Snowboarding Wing Suits, Body Sails, Parachutes, Kites & Chutes - The Original Downhill SPORTING-SAIL - Skateboard, Ski, Snowboard Wingsuit, Body Sail, Parachute© 2007-2019 - All Rights Reserved - Patent No. US D613,316 S - Deploy & Enjoy!